During the home buying process, one critical component to consider is your mortgage rate. Home loan interest rates vary widely from lender to lender. You might wonder if the lowest rate is the correct way to go; there are other factors to take into consideration besides an advertised rate. American Pacific Mortgage believes in giving you the tools you need to make educated decisions. 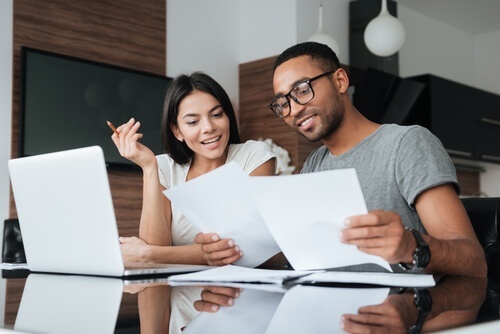 We have compiled a list of tips to help give you confidence as you enter down the path of home ownership or refinancing a current home loan. Tip #1 - Get Educated: Learn all you can about loans and rates in order to compare them. Decide what your goals are for your home purchase and whether you need a fixed or adjustable interest rate. A fixed interest rate means that the rate stays the same throughout the life of the loan. An adjustable rate starts off lower and then increases gradually, usually annually, but not beyond a maximum amount. Try our APM loan calculator to help you compare the two types and decide what might work for you. Get familiar with loan terminology. We’ve made it easy for you by including a Glossary of Mortgage Terms at the end of this post! Talk to trusted family or friends about what types of home loans they have had and what their experiences were with each type of loan to get a better idea of what might work well for your situation. Tip #2 - Look beyond the actual percentage rate: Check rates and costs so you get the full picture. Learn about the Annual Percentage Rate (APR) and points. The APR is the cost of credit, expressed as a yearly rate including interest, mortgage insurance, and loan origination fees. The rate can be adjusted depending on points. A point is equal to one percent of the principal amount of the loan. It’s important to know whether points are included with the APR as it will affect your costs of the loan. A rate may be lower, but may include points, which you will pay for and should account for when comparing home loan interest rates. Understand how points affect your closing costs. If a rate is lower but includes points, you will be prepaying interest for that deduction in the rate. This will mean that you have to come up with more cash at closing time. Sometimes points make sense - if your cost will be recouped in a reasonable amount of time and you plan to stay in the house longer or if you need a lower interest rate in order to have a lower monthly payment. Look into other fees that are included with the loan. These might include Lender Fees, Appraisal Fee, and Title Services Fee to name a few. You can find explanations of these fees in our Glossary of Mortgage Terms down below. Tip #3 - Be skeptical: Do your research as you compare lenders in order to avoid potential issues. Be wary of lenders that have little to no reputation. Check the Better Business Bureau for a grade and complaints and check the NMLS to check on your lender’s license in the state you’re in. Consider how many years the lender has been in business and any complaints or bad reviews online. Does the company publish their customer reviews aggregated from 3rd party sources online. For example, you can check out American Pacific Mortgage customer reviews online here. Be wary of lenders’ titles. There are loan officers, senior loan officers, advisors, consultants, and many other titles. One title is not necessarily better than another. What is more important is finding a reputable lender that you trust and feel comfortable working with. Congratulations on taking the extra step to educate yourself on home loan interest rates and how to compare them! American Pacific Mortgage is happy to give you the tools and information you need to make wise choices during your homebuying journey. Got questions? One of our friendly loan advisors can help answer any further questions you have as you learn more about this process – call or click today. Annual Percentage Rate (APR): The cost of credit, expressed as a yearly rate including interest, mortgage insurance, and loan origination fees. This allows the buyer to compare loans, however APR should not be confused with the actual note rate. Appraisal Fee: Fee charged for receiving a written analysis prepared by a qualified appraiser and estimating the value of a property. Closing Costs: These are expenses, over and above the price of the property, that are incurred by buyers and sellers when transferring ownership of a property. Closing costs normally include an origination fee, property taxes, charges for title insurance and escrow costs, appraisal fees, etc. Closing costs will vary according to the area of the country and the lenders used. Lender Fees: Fees charged by a bank or lender in order to process and fund a loan. These include multiple fees such as underwriting fees, appraisal fees, processing fees, and more. Loan Term: The amount of time that the borrower will make monthly payments on the loan. Origination Fee: A fee paid to a lender for processing a loan application. The origination fee is stated in the form of points. One point is one percent of the mortgage amount. Points: A point is equal to one percent of the principal amount of your mortgage. For example, if you get a mortgage for $165,000, one point means $1,650 to the lender. Points usually are collected at closing and may be paid by the borrower or the home seller, or may be split between them. Specialty Loan Programs: APM offers a multitude of innovative home loan programs to serve your unique mortgage needs. Title Services Fee: Fees charged by the title company in order to record the loan. These include title insurance fees, recording fees, endorsement fees, and more.